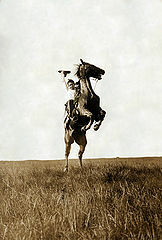 Plunging Bronco, by Erwin E. Smith (1909). Wikimedia Commons. For the past semester I have been working with NDIIPP learning the tools of the trade, creating resources, and crafting fun blog posts (or at least trying). Sad to say, the semester is over. Yes, loyal readers, it is time for me to doff my hat and hit the old dusty trail. Yet, it wouldn’t be a complete ride-off-into-the-sunset-moment without an impassioned speech that tied the whole story together, so here goes. Our records are important. It’s a simple statement, but a point worth delving into. Records are important from a financial perspective (such as taxes, purchases, etc. ), from a legal perspective (proof of ownership, deeds, etc. ), from a historic perspective and familial perspective (genealogy, general warm and fuzziness). However, there is another aspect to the necessity of records. They foster democracy. So, how does this relate to the role of digital stewardship? What does this have in common with digital preservation? Plenty. Internationally, cell phone videos have documented protests, civilian executions and other atrocities. War tribunals and genocide trials can use these pieces of evidence, and more, to convict the guilty, and provide reparation and solace for the victims and their families. In these instances, preserving the data is noble, even dangerous. This is why I first wanted to become an archivist; it’s also why I wanted to become a digital archivist. I wanted to help right the wrongs of history and give voices to the voiceless. To do that, we need to be able to access the evidence that we create digitally. If we can’t do that basic task, then we cannot hope to do anything further. Assuring that we have authentic digital archives, therefore, is a way to ensure that there can be accountability in the long term. Working here at NDIIPP has only confirmed the nobility of digital stewardship. For example, one of the digital stewardship programs here at NDIIPP ensures democracy by providing for the longevity of born digital government records. Another program does the same with public records. In my time here at NDIIPP, I have been overwhelmed by the opportunities presented to do lasting good. As always, I wish you all safe data. This is a syndicated post. Read the original at The Signal: Digital Preservation 2013-05-23. ← Hey Content Creator: Make Mine Lossless!